NYFW is every fashion enthusiasts dream! This is one of the major events on every Fashion Calendar where Designers from far and wide showcase their latest collections for the Spring/Summer season. The unique style and personality of L.A based Fashion Designer is definitely something to talk about and we are quite privileged to bring her exclusive take on NYFW as a Fashion Designer. 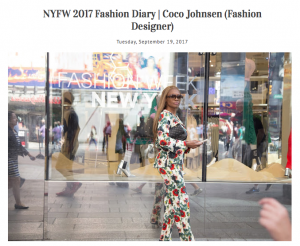 This year, Coco was the invited celebrity guest of the Producer and she shared her Fashion Diary as well as new trend pieces to complement your wardrobe. The Haute Lifestyle got an inside look of what she wore while going from show to show. This entry was posted in About, Social Media, Travel, Wear, Whats Hot! by cocoj11. Bookmark the permalink.